Passion is a word usually associated with sports, but since the cars appeared few things are capable of awakening the same feelings in old and young, and men and women. Surely you are among the people who feel admiration for these machines, in particular, for the classic cars, and it is not surprising, because we live in an era in which we have been taught to love the cars and songs of yesteryear in movies, series, and many other means. If you are interested in getting classic cars pictures, just keep informed or you are in a position to buy our list will be useful. Recognized worldwide for its print edition, Motor Trend is a leading website in the automotive world, although they stand out for their car reviews, car shopping lists and guide for new buyers, they also have a wonderful blog full of news about top classic cars. You should know that this website is a bit slow to load, at least from a computer, so you should be patient when browsing. The news is arranged in chronological order, which makes it easier to stay up-to-date if you visit the site frequently, or you can use the search bar to obtain information or photographs of the car you are looking for. The wide and almost absurd content of Motor Trend will also allow you to keep up with the prices of the cars, as well as the things you need to keep in mind when making a purchase. They have a rich collection of classic cars pictures, small videos, and gifts. 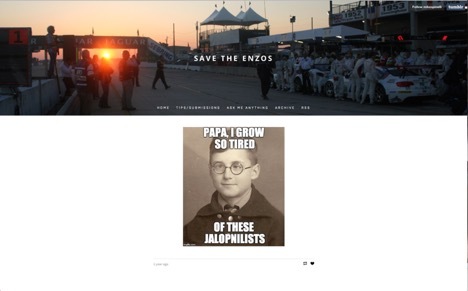 Save The Enzos is a website that offers a varied content of classic cars from the visual aspect, you can get visual material on classic cars of different brands (although the name of the blog inevitably thinks of Ferrari’s), old posters, old photos, among other things. In case you are looking for reading material about classic cars, the feeling when handling them, prices, councils or something similar, this is not the appropriate website for you. In fact, for a while, they maintained a lot of activity on the blog, but recently they have only incorporated a few photos. Exploring their website is very simple, as well as accessing the gallery of recent publications or viewing the entire history to enjoy all its content. You can also ask questions about cars, although it is not clear how long it takes for the administrator and his team to respond. As in the case of MotorTrend, this publication is known worldwide for its printed edition, which was then taken to the Internet through the official website of Hemmings. Here you can obtain a subscription to the print or digital edition, a membership through a user and even acquire souvenirs for your home, workshop or office, including clothes. The fact of being able to buy old cars online through this website, currently owning about 30,000 models available for purchase, from cars ready to be used to projects to obtain the car of your dreams or even to obtain some money after the restoration. You can also buy classic car parts. This website is quite complete, you can get pictures, watch videos, read practical tips on all aspects of classic cars, buy whatever you need, find out about upcoming classic car events and much more, it’s worth exploring its content. If you are thinking about buying classic cars online or selling yours easily, Classic Car Envy adapts to your needs. In this web you will find more than classic cars, you can also see content related to classic trucks, hot rods, and others. They are particularly dedicated to the restoration of classic cars, including heavy cars and trucks. A particularly interesting section is that of the videos, where you can see videos that register all the way to the restoration, so you can see these cars as they go to become scrap in striking vehicles or enjoy the exhibitions of classic cars. You can also get countless photos for your collection or to print, you’ll even have the chance to come across old posters. The councils on this site are especially useful for those who seek to enter their classic cars to competitions, or ways to restore their jewel on wheels as much as possible. 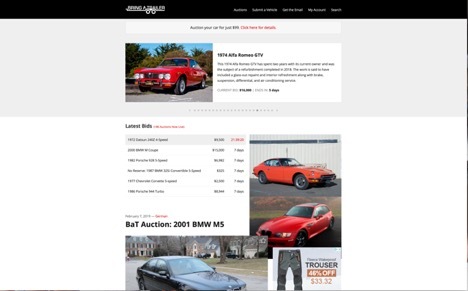 The very name of this website indicates its purpose, through Bring A Trailer you can participate in online auctions of top classic cars and some fewer spectacular cars, to participate in these auctions you must register on the page, but it is well worth it. Here you can look at detailed pictures of the car you are planning to buy and videos, as well as an article dedicated to describing it, if you are at the house of a car ready to drive, this is the place for you. Although this site is especially dedicated to buying and selling classic cars, you can also buy clothes, accessories for your car or read practical tips that you should apply when buying or selling a classic car. There is also information to help you with the subject of sending the car. In addition, you can receive alerts by mail, both the purchases you expect to make and the comments and offers they make for your car at auction. When you enter this website you quickly perceive the familiar feeling in its content and design. Curbside Classic aims to demonstrate that all cars are capable of telling a story, recalling anecdotes, highlighting something or simply being appreciated and valued by its users. To achieve this familiar but professional environment, they have a simple web design, which allows focusing the attention of the one who navigates the stories, how the editors got the photographs and how the owners take pride in recognizing the value of their car. It is definitely a place for people who love and have a passion for cars. You can explore the content in the categories of European, American or Asian brands, without overlooking the Australians. In addition, they have prepared a welcome article, which you should read to better understand the purpose of this website if you intend to join them. 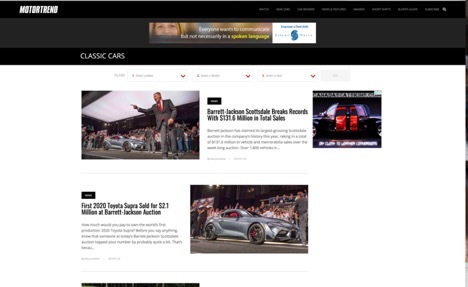 On this classic car site, you can also manipulate content online through articles or videos. 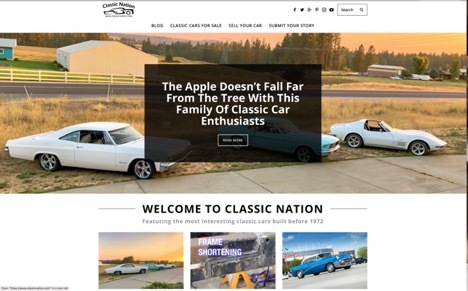 In Classic Nation the developers have obtained a fresh design, which combines advice that every owner should know with videos about how to do certain jobs, lists of good classic cars, and much more. 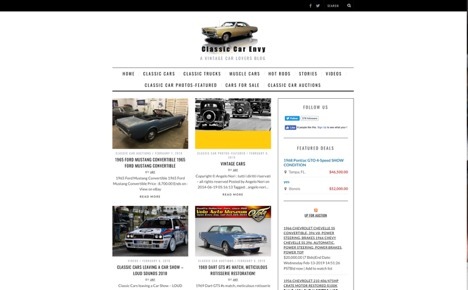 You can also use this online platform to buy or sell your classic car, although you should consider that only cars from 1972 or earlier are allowed, so any model that does not comply with that simple rule cannot be part of its content, this simple Norm offers an advantage compared to other similar internet sites that integrate news of classic cars with contemporary cars. A very valuable aspect of this website is that you can share your story with them so that others also enjoy your passion, so if you think about making a major modification to your classic car, you can document it with photos or a video and then share it with them, it is possible that the comments obtained to give you suggestions or ideas that you had not thought about. The world of cars is exciting, we cannot reduce all experiences, memories and other issues in a few photographs, but by sharing all that you can approach a unique world, full of people with your same interests. The websites that we have shown you on this list are ideal to achieve those objectives. Whether your interests are in getting background images for your computer or cell phone, buying souvenirs, buying or selling your classic car, acquiring parts that you need in your restoration process, or simply enjoying the stories of other people, you have all that in this list. 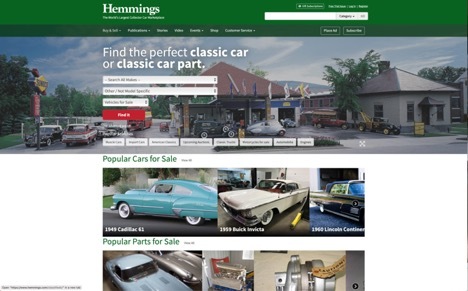 Search our list for the best classic cars websites, some of them emerged from renowned magazines, such as Motor Trend and Hemmings, while others are the result of the inventiveness of their managers, such as Curbside Classic and Classic Nation, we hope that you enjoy their content as much as we do.